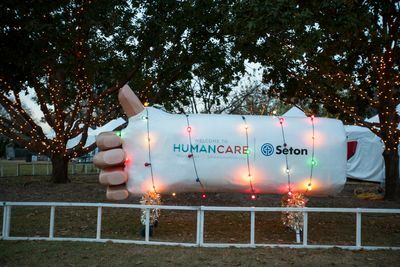 For Seton Healthcare base sponsorship of the Austin Trail of Lights was just the beginning. Since the inception of our partnership in 2012, they’ve worked diligently to create opportunities that promote employee engagement, community support and build their brand, as well as their company goals year-over-year. In years past, Seton Healthcare used their TOL activation and employee volunteer program to promote HumanCare, a program that highlights people doing kind (and not always expected) things for one another as a representation of the care that Seton places on their patients. 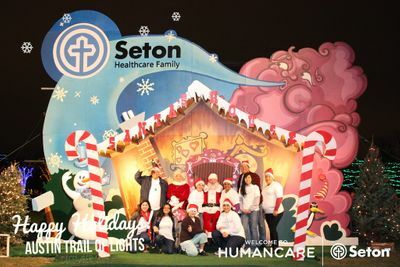 Their Trail of Lights sponsorship aimed to demonstrate Seton's substantial community efforts through a display promoting the HumanCare name, participation in the annual Trail of Lights Fun Run, and engagement with consumers with nightly volunteers at Santa’s House. HumanCare t-shirted volunteers stood in all of the Trail’s lighted tunnels to guide and assist trail-goers with taking photos. Needless to say, the kind HumanCare voluteers were quite popular allowing family and friends to have their entire group in photos! Staffed with about 15-20 HumanCare voluteers per night, Santa’s House also received the love with offerings of handwarmers and candy canes to chilly guests. Volunteers were also present at the main Info Tent to hand out handwarmers, lip balm, facial tissues and more. Seton’s partnership with the Trail of Lights is by far one its most popular volunteer events they do as a company overall! Even Seton President, Greg Hartman, participated in the HumanCare volunteer program at the Trail of Lights. 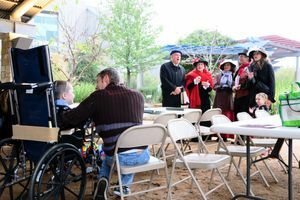 Each year, the Trail of Lights team visits Dell Children’s Medical Center bringing to the patients a day of special holiday programming including crafts, live movie characters, lights and displays within the hospital’s Healing Garden. It’s always a joy (and one of our favorite ways to give back) to bring a little Austin-centric holiday spirit to the kids and families who otherwise wouldn’t have an opportunity to see the Trail of Lights. 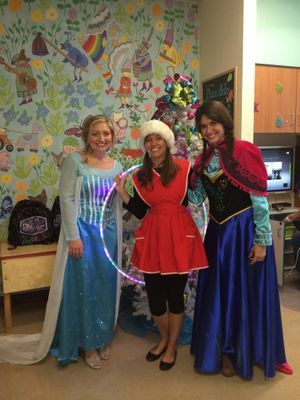 In 2014, the Austin Trail of Lights marketing team visiting the Dell Children’s Medical Center dressed in Frozen costumes. In 2015, the Austin Trail of Lights team created a lighting display in the Healing Garden at the hospital. String lights and original TOL displays filled the courtyard bringing smiles to the patients and their families. Patients could even see the lights from the comfort of the interior of the hospital if they were medically unable to go outside. 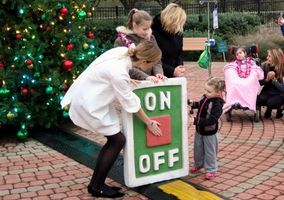 With goals to shift Seton’s brand focus from Seton to Dell Children’s Medical Center in 2016, the brand decided to further their holiday marketing efforts through expansion of their Trail of Lights sponsorship. They worked alongside our team to redesign the Santa’s House display with Dell Children’s Medical Center branding. This display was a perfect fit for the hospital’s brand at around the holidays—by providing children that they place such care on with visits from Santa Claus at Christmas Time. Dell Children’s Medical Center also wanted to use their sponsorship as a cross-promotional tool – to connect their support of and involvement with the Austin Trail of Lights back to their hospital who focuses on taking care of children and their families. To accomplish this goal, as in years past, we extended the brand’s programming offsite. We brought the Austin Trail of Lights to the hospital, literally into the backyard of Dell Children’s Medical Center, with a large Christmas tree and authentic Trail of Lights displays. Taking the Trail offsite also served to show employees how important the Trail of Lights sponsorship is for them. Although not every Austinite is able to attend the event, we were able to bring a little bit of the tradition, nostalgia and joy of the Trail to them. 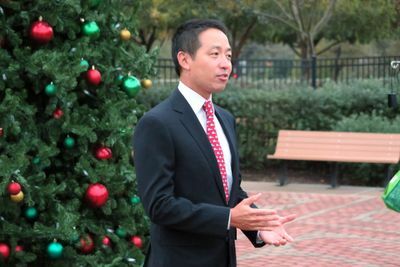 Mark Shen, MD, president of Dell Children’s Medical Center, kicked-off the event. A tree lighting event took place to celebrate the new installation with food trucks, carolers, activities and more for patients and guests to enjoy together. To read more about how we expanded the Austin Trail of Lights to Dell Children’s Hospital, click here. As a  Presenting Sponsor, Seton has always gone above and beyond with their partnership to the Trail of Lights. Their support of and dedication to the Trail of Lights Foundation and their patients is a perfect example of how to build and expand upon a base sponsorship level in order to fully support the Austin community, marketing and PR efforts throughout the year. Have you considered how you can expand your company efforts through engagement with philanthropic activities and community support? 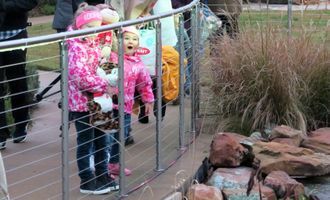 Sponsorships at the Trail of Lights provide the perfect setting for achieving company brand/marketing goals and beyond. From brand exposure and audience engagement to innovative activations that people can see, touch and hear—the options are endless to achieve your goals for many years to come. Our production staff can help you build inventive activations and displays to wow and excite that are outside the traditional sponsorship space. Contact us today to build out your next experiential marketing campaign while supporting a community staple right in the heart of Austin, TX!